The Axis XTRA 17R is the newest addition to the Mega-Lite Axis family. Housing a 350 watt 17R lamp, the fixture has a very strong output and long throw. The unit is equipped with 13 static gobos plus open, 9 rotating gobos plus open and 13 colors plus open. 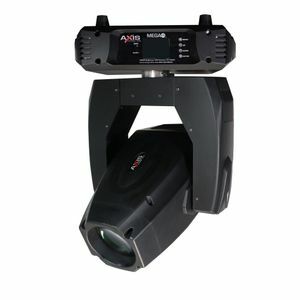 Additional effects include a 16-facet rotating prism in both directions, electronic focus, a frost filter, and an easy to navigate touchscreen LCD display.